More than a year after partnering with Uber to provide free, on-demand rides within City limits, the City of Lone Tree is rolling out an upgraded version of its Link On Demand transit service on Monday, Feb. 4. During the pilot phase, which launched in August 2017, Link On Demand provided more than 20,000 rides in Lone Tree to major employers like Charles Schwab, Sky Ridge Medical Center and Park Meadows Retail Resort, as well as the library, recreation center and Lone Tree Arts Center. The upgraded Link On Demand service features a new app, call-ahead ride scheduling and overall better service. To use, riders must download the new Link On Demand app available on Apple App and Google Play stores. Once downloaded, riders simply enter their origin and destination within City limits, and they’ll be picked up in one of the City’s branded 12-passenger, wheelchair accessible, family-friendly shuttles driven by professional drivers. Riders can also request their rides by calling 720-990-0176. Hours of service are Monday through Thursday from 7 a.m. to 7 p.m., Friday from 7 a.m. to 10 p.m. and Saturday from 10 a.m. to 10 p.m. 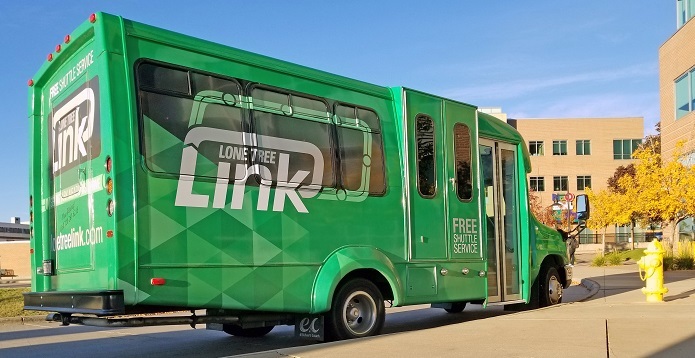 The public is invited to join Mayor Jackie Millet, Council and City staff in celebrating the relaunch of Link On Demand on Monday, Feb. 4 at 10 a.m. at the Lone Tree Arts Center, 10075 Commons St.